"We know you're not Mexican, boy. Where do you belong?" 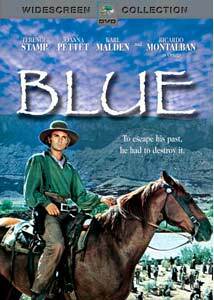 Blue (Terence Stamp) has always been an outsider. The adopted son of the ruthless Mexican bandit Ortega (Ricardo Montalban), the blond-haired blue-eyed gring0 certainly looks out of place among his fellow criminals. Still, Ortega holds him closer to his heart than any of his legitimate (or illegitimate) sons; he claims he is most like him, but upon closer observation, it seems the loud, rambunctious Ortega strives to take on the silent, brooding demeanor of Blue. There is undeniable power and prowess in his method, and most of the gang has learned to steer clear of this man from the north. Across the border, Doc Morton (Karl Malden) and his daughter, the fair Joanne (Joanna Pettet) are celebrating Independence Day with their fellow settlers. Joy turns to horror as Ortega and his men crash the party, pillaging and killing. In the maelstrom, Blue kills one of his own to protect Joanne, and is wounded in the process. A crime with no witnesses, Blue is puzzled as to why he would kill a brother for a Yankee he never met. Left for dead by the bandits, Joanne and Doc Morton tend to the broken man, healing both body and spirit. Joanne takes a shining to the outsider in short order, convinced Blue is a changed man. When Ortega learns of Blue's state, he will not let his son go without vengeance against those who reformed his ways. Blue must decide where he belongs, and fight to protect all he holds dear. Silvio Narizzano's violent western is quite the fascination. The script, though contrived and predictable, remains a rather engaging tale of divided loyalties that shoots off into Seven Samurai territory by the film's close. It's the execution that needs the most work. Despite some clumsy zooming, the Panavision scope visuals capture the grand locations splendidly; however, for every breathtaking vista of sprawling countryside, there is another poor use of day-for-night. Even with heavy blue filters, these portions were obviously shot during the daytime, resulting in images that look dark and underexposed. These bits, combined with studio sets lit like a disco club, amount to a distracting mish-mash of imagery. These cheesy bits are certainly entertaining. And who in their right mind can pass up a Western starring both Terence "The Limey" Stamp and Khan himself, Ricardo Montalban? I certainly couldn't. Maybe I'm the only one. Stamp does his darndest to channel Clint and to conceal his British accent, but with little success; the result is an interesting blend of Southern twang and English prim. Regardless, he does a decent job brooding throughout. Montalban gives an impassioned performance only he could deliver—kind of tough to do among his gang, which dresses and acts like circus animals, prompting more laughter than fear. Joanna Pettet and Karl Malden fill their somewhat limited roles adequately. I'm probably grading this too high, but heck, I enjoyed it. My advice? Savor this one-in-a-million Western for its cult cast, and unintentional humor. I reckon you'll have a blast. Image Transfer Review: Paramount's anamorphic 2.35:1 image is surprisingly excellent. Paramount seems to have transferred this dusty catalog title with care, delivering a relatively clean transfer with bold color, good detail and solid contrast. Some grain crops up here and there, and fleshtones run a bit on the red side, but I remain impressed. Audio Transfer Review: The English monaural audio is clear enough, and captures the robust sounds of gunshots and the ethnic musical score, which inexplicably contains an Indian tabla (!). Extras Review: There are no extras whatsoever. For shame. Stamp. Montalban. Cheesy Western. Need I say more?